In 1925 the Irish government denied 750,000 people faced famine, however in the West of Ireland several people had already starved to death, recently unearthed state files reveal the details of another disturbing cover up. The governing party, Cumann na nGaedheal, were committed to bringing the country back onto an even keel. However this led to one of the darkest chapters in Ireland’s economic history when they attempted to cover up severe levels of starvation among substantial numbers of the population. The government plan was simple and will resonate with many today – extreme austerity. A highly conservative party, they were committed to trickle down economics seeing large farmers as the engine of the economy. Therefore they tried to cut the richer farmers’ tax and costs while also reducing government expenditure – regardless of the social cost. In 1923 they supported these farming interests in a vicious labour dispute that saw wages slashed by 16% and the seven-day working week reintroduced. In 1924 Finance minister, Ernest Blythe, cut the old age pension by 10%, something that would haunt the government in years to come. However worse was to come. The harvest in 1923 and, in particular, 1924 was nothing short of disastrous. The weather, while not particularly cold, was unusually wet. Crop yields collapsed. The potato – still the main food source for many rural poor – rotted in the fields. Fodder was impossible to find and animal stocks died in large numbers from hunger related diseases. To compound this crisis, it was not possible to dry out turf – the main fuel source for the rural poor. The worst affected areas were in the west of Ireland and particularly the Atlantic Islands. These areas hadn’t been changed much in decades. 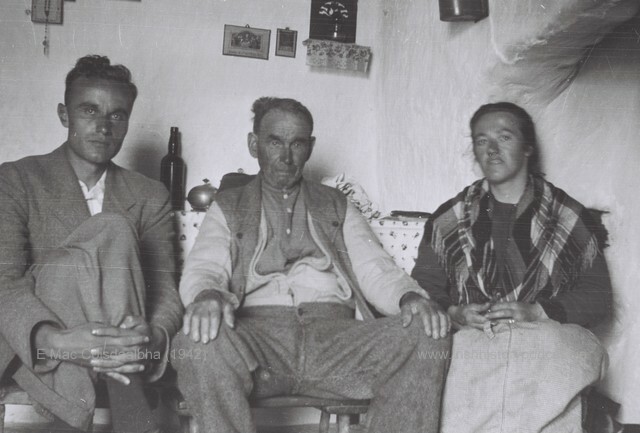 This picture taken in 1942 shows my grandfather Eamonn Mac Coistealbha (left) with two islanders in traditional dress that hadn’t changed much in decades. As early as the 20th of August 1924 the Meath Chronicle reported “a famine condition is imminent as bad as 1847”. Through the early autumn, local and national newspapers were littered with similar predictions of mass starvation. These dire predictions of mass starvation were not just the work of newspaper editors prone to sensationalism. In September 1924 after The Anglo-Celt, a Cavan based newspaper, predicted a famine, the local branch of Cumann na nGaedheal complimented this “timely exposure of the true state of affairs….the shadow of famine is overspreading the outlook of the poor peasantry”. By October, people in Connemara were reported to be surviving on seaweed and shell fish. Even though the government voted through £500,000 in aid, the crisis continued to deepen and by early January 1925, the worst predictions began to materialise in the west. On New Year’s Eve 1924, a doctor was called to the home of Michael Kane who lived on Omey Island. Arriving at the house, the physician found “Kane was lying on the stone floor near a small turf fire. His emaciated face showed only too plainly the cause of his illness. The man was starving and too far-gone to benefit from medical attention. Two children, of three years and two years, respectively were lying by the fire trying to keep warm. They too were weak for want of nourishment.” Kane died two days later in Galway hospital from typhoid, his body too weak to resist. He was not the only casualty. In January and February, newspapers in Clare and Galway reported the deaths of over 10 people, predominantly children, from starvation or starvation related disease. Harrowing accounts of desperate poverty filled newspaper columns. The charity, Queen Victoria’s Jubilee Nurses’ organisation, saw a large increase in “maternity and child welfare” cases from 51,106 in 1924 to 67,295 in 1925. While the Manchester Guardian termed what was happening in Ireland as a famine, this may have been an exaggeration. While it is true people were dying from malnutrition and starvation, the view of the President W.T. Cosgrave is perhaps more accurate. He described the situation of distress as “considerably greater than normal, but comparison with 1847 is, I am glad to say not justified. There is no question of famine in that sense”. 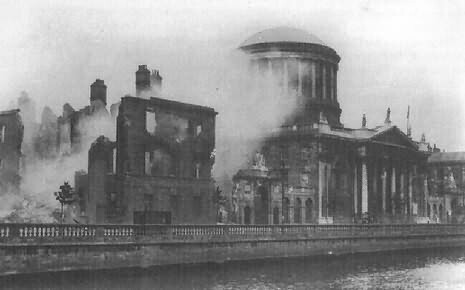 Using the worst famine in modern European history as a bench mark nevertheless illustrated the depth of crisis. 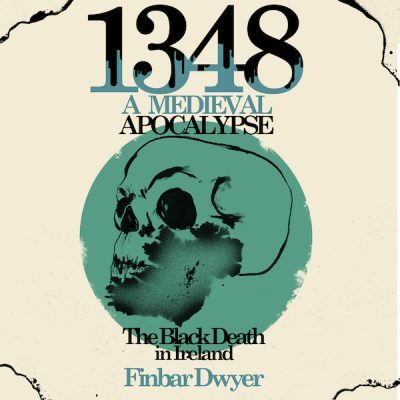 Given the prominence of starvation in the Irish psyche and history, the fact that there were people starving to death in Ireland only three years after independence ensured this crisis had ramifications far beyond the humanitarian sphere. Initially the government appeared proactive. Although fiscally conservative they had provided £500,000, a considerable sum of money for the time. They also began to ship coal supplies into the west of Ireland to replace the saturated turf. They publicly released statistics predicting that 153 townlands across eight counties – Cork, Kerry, Galway, Cavan, Donegal, Clare, Leitrim and Sligo were in distress and generally impoverished. However in early 1925 their approach began to change, when the crisis attracted international attention. 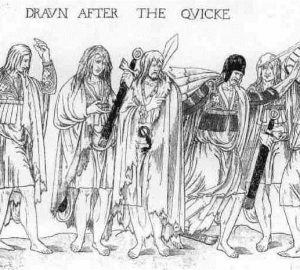 English newspapers began to carry articles outlining the nature of events in Ireland. In the following months it was carried around the world; by April it was receiving prominent attention in the Soviet Daily Pravda. However it was The Manchester Guardian that carried the most detailed reports which claimed around 750,000 people were starving. 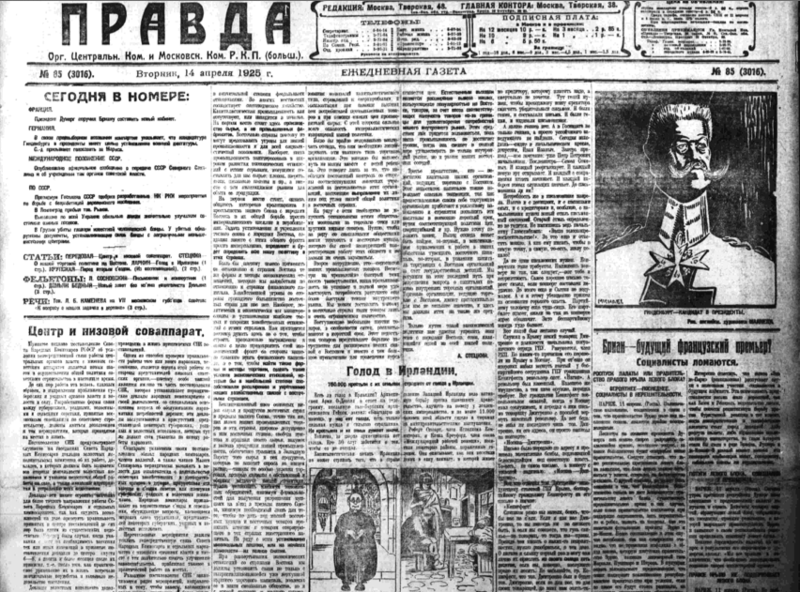 Pravda, April 14th 1925. The article in the bottom center of the picture is relating to the crisis in Ireland. The cartoon depicts a priest on the left and a starving family on the right. Prior to February 1925 the government, while denying the worst excesses, acknowledged they faced a severe crisis. On February 7th, the Ministry for local Government claimed, “not one instance had the ministry received information of actual starvation or famine” but added there was “acute distress”. This was untrue given the press had carried numerous stories of deaths during previous weeks. However on February 13th, the government’s position shifted dramatically. Hogan’s claim was not only at odds with media reports over the previous six months but also with his own colleagues. His close friend and minister for Justice, Kevin O’Higgins, had predicted food shortages in a speech marking Independence in December 1924. On January 31st, the president, W.T. Cosgrave, wrote a memo to the editor of the New York Evening World saying he believed that the crisis in the west was so severe that it could “not be met by perennial relief measures heretofore adopted”. Finally, his own Department of Agriculture was well aware of the extent of the crisis. Later in 1925, the departmental secretary, F.J. Merrick, reflected on the 1924 potato crop as “practically a complete failure”. Hogan was not the only one to ignore the suffering and starvation of the population. No one in the Dáil challenged the minister’s assertions – not even the leader of the opposition Labour Party, Thomas Johnson. Indeed despite the fact that there were numerous cases of deaths and widespread reports of destitution, the topic of starvation or ‘distress’ did not dominate political debate in the following weeks. When the topic was discussed, the government was almost hostile. During a debate in March, which discussed distress in County Clare where cattle herds were dying in large numbers, Hogan again denied any great crisis. On this occasion he blamed the electorate of Clare for electing poor local politicians. Later in 1925, as international attention waned, the government returned to its earlier position of acknowledging acute distress in certain areas. Why cover up the crisis? The incident that triggered this callous and dangerous denial and cover up was almost certainly a telegram received from the U.S. On February 11th, the cabinet received a telegram with a cover note from James Douglas, a member of the Seanad and a prominent Irish businessman. The telegram, from the editor of the Boston Globe, was seeking official clarification on whether there was a famine in Ireland. Douglas added his opinion that “the present propaganda in the United States, alleging that there is a famine, will do great harm to our credit in every way unless it is countered”. This appears to have been decisive. Concerned with the interests of large farmers and their emerging new state, this fear of international rebuke touched a nerve with Irish politicians. After only three years of Independent rule, they were nothing short of hypersensitive about the country’s international image. When faced with a choice of downplaying the starvation or risking their international reputation, the choice was simple for the politicians of Cumann na nGaedhael. Individuals like P.J. Hogan lived in a world apart from those who were starving. He belonged to a different class, believing an ordinary farmer to be a “200 acre man” – which to many of those starving was a vast farm. His government colleagues had already been heaping a disproportionate economic burden on the rural poor. Their indifference was seen in the budget of early 1925 when, amid a chronic fuel shortage, they taxed blankets. The Executive (cabinet) in 1928. The president (a position similar to the Taoiseach today) W.T. 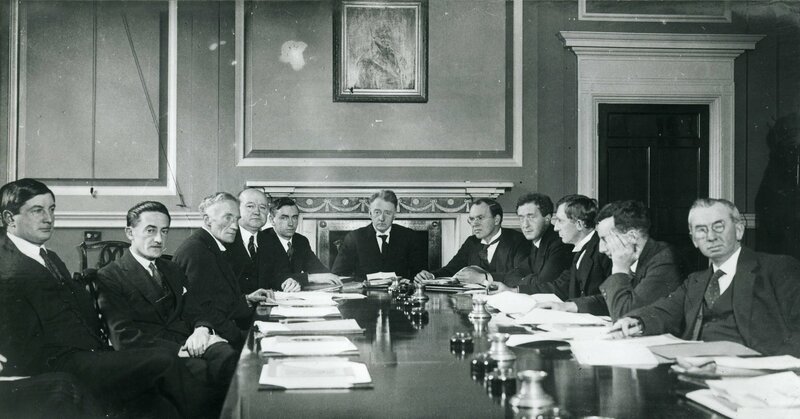 Cosgrave is in the centre, Ernest Blythe (minister for finance) is immediately to the right while Patrick Hogan (the minister for agriculture) is the man leaning on his hand second last from the right. In this light when the starving poor were pitched against the new state’s reputation the choice for Cumann na nGaedheal was relatively simple. The denial that the country was in crisis was simple but had serious ramifications. As the government oscillated between denial and acceptance, there were no co-ordinated and effective solutions offered and the crisis continued through the first half of 1925. Private relief funds struggled to raise large amounts of money while the government denied there was a problem. 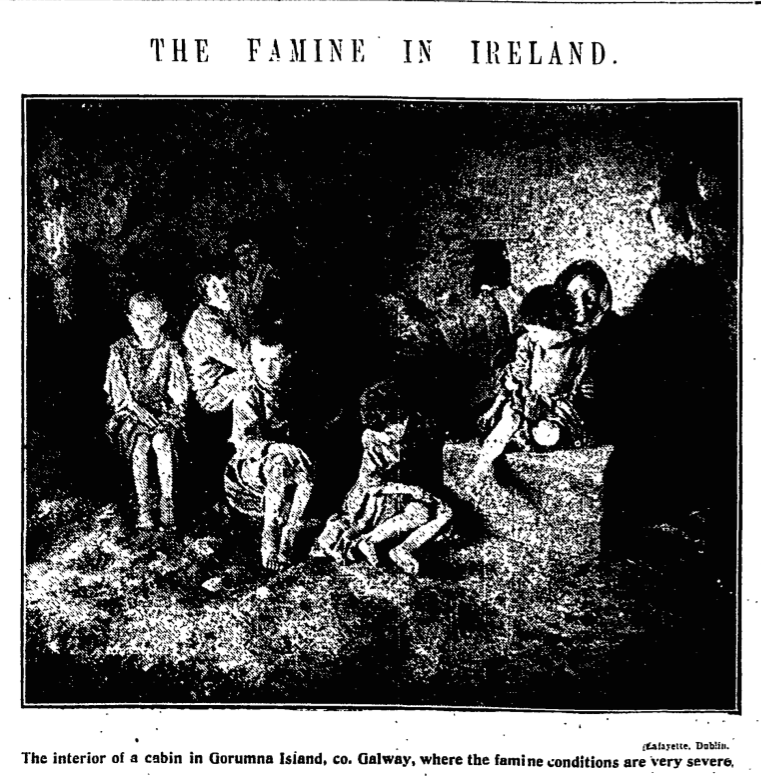 On June 6th The Irish Times reported “destitution and sickness” worse than it had been during the previous winter. The same day The Anglo Celt stated ‘should the unseasonable weather continue there is noting for the country but a famine and it would be criminal to disguise the fact’. However in the Dáil the government, while increasingly acknowledging there was a crisis, argued it was exaggerated. Ultimately, Ireland was saved from a full blown famine in later 1925 and 1926 but not by government action. Instead a greatly improved harvest in the Autumn of 1925 saw the plight of most of those at risk improve slightly. In the following years it was not only the politicians who were happy to see this dark chapter forgotten. A journalist with the Connacht Tribune in 1925 noted how “The poor people conceal their poverty sometimes even from one another. They reveal a strange mixture of pride and fatalism.” This pride may explain why the victims of arguably one of the greatest crises since independence, did not want this chapter of our history given prominence. Producing independent research like this article is time consuming and expensive. If you enjoyed the article and want to fund more original research like this you can contribute here. Superb article. Keep up the good work. I wonder why this article is not seen to have an author? 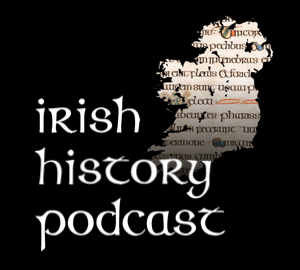 This is an elegantly crafted and vitally important post on this period in Irish history. Thank you very much for your hard work. There is no author listed anywhere for this piece, and that severely limits the ways in which it might be used by students and scholars. very interesting article , I did not hear anything about this before , this is social history of modern Ireland which really challenges the idea of the New Free State trying to build a fledgling economy. Peadar O’Donnell’s novel Adrigoole (1929) translated into Irish by Seosamh Mac Grianna as Eadarbhaile deals with this subject.